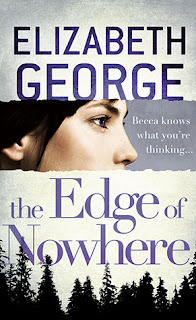 The Edge of Nowhere by Elizabeth George was quite interesting with characters I cared about and wanted to get to know more about. Despite a thrilling prologue, it was a bit of a slow start. This is Elizabeth George's (I believe) first foray into writing for teens after writing many mystery novels for adults. While the characterisation is interesting and through Becca's gift, we are able to see into the heads of other characters, I found the writing style to be slightly more distant than I'm used to. It took awhile for me to adjust to this distance, but once I did, I found myself really enjoying this journey alongside Becca King, our main narrator. Becca King and her mother are on the run from Becca's stepfather who has done some pretty bad things. Becca knows about these things because she can hear the whispers of other people's thoughts. In order to protect themselves, Becca and her mother have changed their names and appearances and have travelled up north to Washington. Becca's mother needs time in order to get everything sorted for their protection, so she sends 14 year old Becca to live on this island with an old friend of hers. But things do not go to plan as this friend that Becca is meant to be staying with dies before Becca arrives and Becca can no longer reach her mother on her mobile phone. But with the help of a local boy, Seth, Becca is taken in by Debbie Grieder and with Becca's arrival onto this small island and her interactions with this small group of people, the mystery begins. There are some really great characters that populate The Edge of Nowhere. There's Becca who is doing the best she can with a difficult ability and without the security of her mother nearby. She struggles with knowing whom to trust and also in a lack of confidence in her appearance. There's also Debbie Grieder, the recovering alcoholic with demons of her own who takes in Becca. She has her own problems to face and having Becca around seems to bring all of those issues to the surface. There's Seth Darrow, who has to face the island's judgement because he dropped out of high school and for the company he's kept in the past. He's in love with a girl and they constantly bicker but Seth seems only to be concerned with his own involvement and can't see that there's more at stake in their relationship. There's also mysterious Diana, who pops up when Becca needs her the most and is the only person who seems immune from Becca's thought-reading ability. And lovely Derric, the Ugandan boy who has been adopted by a family on the island. Becca is immediately drawn to Derric and when things go wrong for him, Becca seems to be the one person who can save Derric. I really did love the characters in the book. I love how they're all connected and their stories and friendships overlap in this messy, realistic way. I really liked seeing how Becca's extra ability seems to wreak havoc in her life and doesn't seem able to steer her out of trouble but seems to land her into it even more. I did love how Becca tries her best at mystery-solving in order to answer those questions of what happened that day in Saratoga Woods that leaves someone she cares about in a coma. But most of all, I loved that bits about trust and love and living life and about guilt and blame and moving on that come to Becca through her interactions with the people in this small community. I will be looking forward to reading more of this story as this series continues! I admire George's adult books, and look forward to reading this one! Thanks for your review. Fantastic review, Clover! Somehow this author has passed by my radar, but she sounds interesting. This is definitely a book that I'd like to try. This one is on my shelves waiting to be read!